Whether you are already registered with a cryptocurrency exchange or you’re just scouring the market for something to grab your attention, there’s no denying it: Coinbase sure has a nice ring to it. And for anyone who’s spent any amount of time reading articles and reports on cryptocurrencies, the name is bound to ring some bells. It’s no surprise, really, if we take into consideration the fact that this exchange has been around since 2012, which, in crypto time, is a long, long time. Now a well-established household name, over the last five years, Coinbase has managed to overtake and replace former rising stars and become one of the most popular cryptocurrency wallets and exchange services. -What is the Bitcoin price? -Where can you download the Coinbase app and is it easy to use? We will also spend some time to talk about the differences between Coinbase and GDAX, how to get started with trading, details concerning transaction limits, additional functionality, customer support and profits. Just to give you an idea how big this company is, we will start our Coinbase review with some general information. These guys are based in San Francisco, the capital of the world as far as technology is concerned, but its reach is global. Coinbase offers its services in 190 countries all over the world, including Bitcoin transactions and storage. For users who want to exchange their digital assets like Bitcoin and Ether with fiat currencies, that option is available in 32 countries, up from 25 in 2017. The 32 countries are Australia, Austria, Belgium, Bulgaria, Canada, Croatia, Cyprus, Czech Republic, Denmark, Finland, Greece, Hungary, Ireland, Italy, Jersey, Latvia, Liechtenstein, Malta, Monaco, Netherlands, Norway, Poland, Portugal, San Marino, Singapore, Slovakia, Slovenia, Spain, Sweden, Switzerland, United Kingdom and the United States. But this is not where the impressive numbers stop. Among additional statistics, by November 2017, the Coinbase exchange successfully offered its services to a total of 13,300,000 users, exchanging close to $50 billion in a wide variety of digital currencies. It currently has 200 employees working 24/7 on keeping everything running smoothly, offering quality customer service and researching and developing new features. As early as 2013, it was already the biggest cryptocurrency exchange in the world, as well as the Bitcoin startup with the highest funding. The money behind Coinbase often came from traditional banks and financial institutions, which is why this is one of the few cryptocurrency exchanges which support bank transfers and accept credit cards. When it comes to cryptocurrencies, though, it’s all about the basics and going back to the roots of the cryptocurrency boom. Coinbase exchange supports only the big four: Bitcoin Cash (BCH), Bitcoin (BTC), Ethereum (ETH) and Litecoin (LTC). 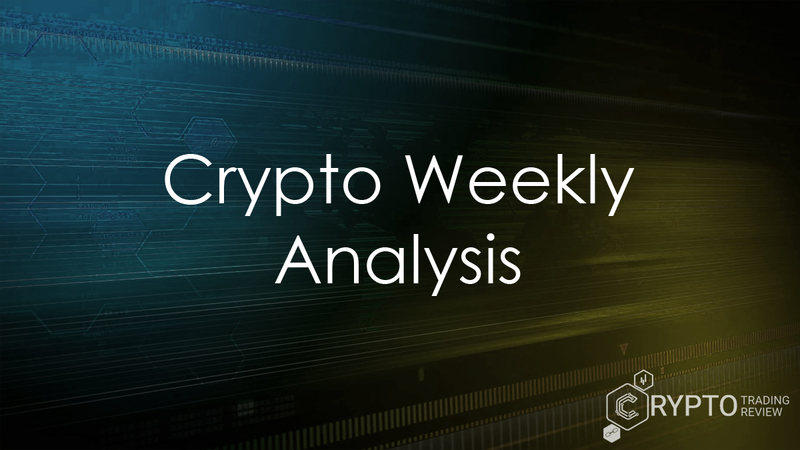 The company’s history and importance for the cryptocurrency market are among its main selling points, which is why any Coinbase review should take a moment to look back and mention some key names and events. Although it officially launched its services in 2012, the company was founded one year prior, in 2011. The two key people who came up with the idea and started Coinbase are Brian Armstrong and Fred Ehrsam. Armstrong is the acting CEO, himself a major investor in Ether, and one of the key people responsible for the rising popularity of Bitcoin and other cryptocurrencies. He managed to secure an additional $100 million in funding for Coinbase as recently as August and helped trade volume grow more than eight times over the course of 2017. Although Fred Ehrsam is no longer with the company, his contribution was essential for its success in the early days. As a computer science graduate from Duke University and prodigy currency trader for Goldman Sachs, Ehrsam managed to secure $30 million from major investors like Andreessen Horowitz back when Coinbase was just getting started, which made it the highest funded startup in the crypto industry. His goal was to make Coinbase “the PayPal of Bitcoin”. In 2014, he was featured in the seminal documentary The Rise and Rise of Bitcoin, which details the early days and the rapid development of the cryptocurrency market. October 2012: Coinbase launches its services. The first available options included buying and selling Bitcoin via traditional bank transfers. May 2013: Union Square Ventures, an influential venture capital firm, invests $5 million in Coinbase. Soon afterwards, it receives $25 million in investments from Ribbit Capital and Andreessen Horowitz. Throughout 2014: Coinbase becomes more and more popular and soon reaches the magical number of one million users. Its influence grows, allowing it to acquire Blockr (the blockchain explorer service) and Kippt (the web bookmarking firm). Also, it increases its reliability and security by securing insurance to cover for the Bitcoin stored on Coinbase servers. In tandem, a high-end vault system is launched, making Bitcoin storage even more secure. Later in 2014, the company partners with PayPal, Stripe and Braintree to enable Bitcoin payment for traditional financial companies for the first time. Companies like Dell, Time Inc., Expedia, Overstock and Dish Networks soon joined the initiative and also partnered with Coinbase, allowing them to accept payments in Bitcoin. In 2015: Several banks, the New York Stock Exchange and USAA, brought together by Draper Fisher Jurvetson, the venture capital firm, together invest $75 million in Coinbase. The investment came in January, and marks the first time that traditional financial institutions have invested directly in a company focused on Bitcoin and other cryptocurrencies. Prompted by the investment, the company developed its Coinbase Exchange, a separate Bitcoin exchange that focused on professional Bitcoin traders. Throughout 2016: In March, Richtopia, a UK-based media company that focuses on emerging technologies, global economics and smart investing, listed Coinbase as the second most influential blockchain and cryptocurrency organization in the world, behind only CoinDesk. In July, Coinbase added Ether as the second cryptocurrency available on the exchange. In 2017: Beginning in March, the company started implementing Litecoin support. By October, users with a U.S. bank account gained access to instant purchases for Bitcoin, Litecoin and Ethereum. This meant that users no longer had to wait for days when making a purchase using a bank account. In December, the Coinbase app became the single most popular and most downloaded app in Apple’s App Store. Also in December, the exchange added Bitcoin Cash to its portfolio of cryptocurrencies available for purchase. Let’s get to the meat of this Coinbase review now. The exchange was initially developed for private users and small-time Bitcoin enthusiasts – to make it easy for ordinary people to buy cryptocurrencies and enter this strange new world of investments. However, with the introduction of Coinbase Exchange, it extended its reach to service professional-level traders, as well. Coinbase Exchange was rebranded and became GDAX (Global Digital Asset Exchange) in 2015. These two cryptocurrency exchange services, Coinbase and GDAX, are now the two core products fielded by Coinbase. In short, GDAX is a professional trading platform for trading a wide variety of cryptocurrencies, while Coinbase serves as a retail middleman to exchange the 4 major cryptocurrencies for fiat currencies. Additionally, Coinbase has its own, immensely popular cryptocurrency wallet. The wallet can be accessed online or by using the Coinbase app, available both on Android and iOS. The wallet model resembles a bank more than other Bitcoin wallets, since the company retains control over all private keys. Because of that, many users who prefer more control use Coinbase only for buying and selling Bitcoin, and they transfer their coins to a separate wallet after purchase. Alternatively, you can use additional storage options developed in-house. The Coinbase Vault and the Multisignature Vault are more advanced versions of its Wallet, with more freedom, control and security. Cryptocurrencies stored in the Vault can be protected by multiple validators. Before making a withdrawal, all validators (or approvers) must confirm the authenticity of the withdrawal before it is processed. The process takes 48 hours, which may seem like too much to some, but it gives account owners the ability to cancel a withdrawal request that they didn’t make. But our Coinbase review is just getting started, so keep reading. Although Coinbase and GDAX are separate, they are still two parts of the same company. The first one is more casual and consumer-oriented, while GDAX is the Coinbase-run advanced trading platform. If you register on Coinbase, you can automatically access GDAX, as well. When you create an account on either exchange, the system creates a twin account on its counterpart. The login credentials are shared, which means you can access both Coinbase and GDAX using the same email/password combination. It is also possible to avoid Coinbase fees if you use the platform for your bank transfers (to send funds to Coinbase), and separately using GDAX to buy and sell cryptocurrencies. There is one thing to keep in mind regarding fund management, however: While deposits are essentially unlimited, the exchange has a daily withdrawal limit of $10,000. This cap can be increased, but users have to apply for the limit increase and wait for it to get approved. When it comes to fees, GDAX likes to keep it simple. There are two kinds of fees: maker fees and taker fees. In simplified terms, the maker is the user making an offer on the exchange, for example, offering to exchange Bitcoin for USD at a certain price. The taker, on the other hand, is the user who takes the offer. GDAX does not have a Maker Fee, so 0%, independent of offer volume. The Taker Fee equals 0.25%, but the fee decreases for larger amounts and traders who trade often, and can be as low as 0.1%. Compared to Coinbase fees, GDAX fees are noticeably lower, which means that trading cryptocurrencies on GDAX is more affordable in the long run. True, GDAX requires a bit more knowledge and skill and resembles an actual stock trading platform as opposed to the user-centric interface of the platform, but it is worth it if you are serious about trading. Compared to 0.25% on GDAX (maximum), Coinbase charges 1.49% on all transactions. In practical terms, this means that buying $4,000 worth of cryptocurrencies on Coinbase will cost you an additional $300, compared to only $50 on GDAX. Above-standard security: 98% of all funds are kept off line in cold storage, which makes them secure against tampering and attacks. Apart from that, as a market leader, GDAX is often subjected to strict financial and IT audits to make sure it’s up to par with high industry standards. Insurance: To follow up on the previous point, in case something eventually does go wrong, every GDAX user has been insured and is eligible to receive up to $250,000 in case they incur a loss. Excellent trading interface: GDAX features a top-of-the-line platform with a simple order process, order books in real time, charting tools and access to your entire trading history. Application Programming Interface Support: Users can utilize this additional functionality to implement and use secure trading bots. For example, the bots can be programmed to monitor GDAX’s Websocket feed, which offers immediate access to valuable market data in real time. Margin Trading: The term margin trading refers to a trading practice which allows users to use borrowed funds (from a third-party broker) to trade cryptocurrencies and other assets. The assets that are traded then represent the collateral for the broker’s loan. The limits are up to $10,000 on BTC/USD and ETH/USD pairs, 3,000 EUR for BTC/EUR pair, and $500 for LTC/USD pair. In spite of GDAX’s excellent platform and security, with a market as big and as vibrant, but simultaneously as young as the cryptocurrency market, there are bound to be some hiccups along the way. One such hiccup occurred in June of 2017, when the price of Ethereum suddenly plummeted from $319 to just 10 cents within a couple of seconds. The event was triggered when a massive multi-million sell order hit the exchange. The order was so big that it matched all of the buying orders and caused the price of Ethereum to decrease suddenly. As soon as Ethereum was worth less than $224, all market positions on the order book were forced to liquidate one by one. With no more buy orders, Ethereum was practically worthless for a brief period of time. 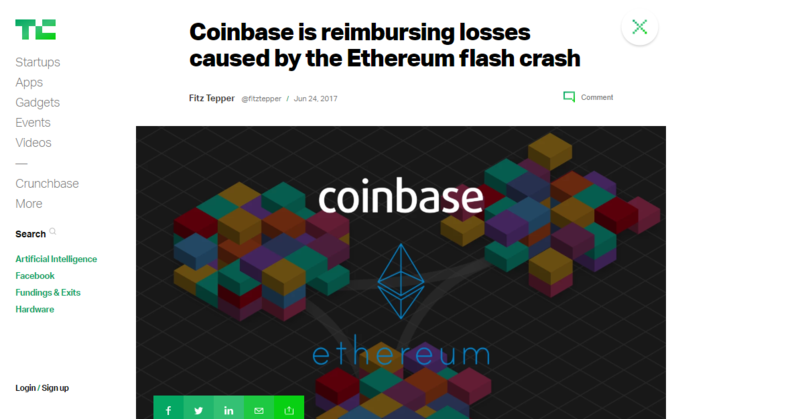 While the event wasn’t a real crash and lasted only for a few seconds, the investors who took a hit were justifiably outraged, and the incident hurt GDAX’s and Coinbase’s reputation during that time. GDAX conducted an internal investigation into the incident and released an official statement three days later. The statement was detailed enough to clear GDAX of any suspicion. It also proved that the exchange’s trading engine worked as intended. Nevertheless, approximately 800 users were directly hit by the flash crash. As a consequence, GDAX decided to compensate those users and credit their accounts out of their own pockets to cover for the losses incurred. Since GDAX also honored all the buy orders that went through instead of reverting the transactions, the company lost almost $9.5 million. The decision to fix the problem and help the users, even though their loss wasn’t caused by GDAX, helped mend its reputation and solidify GDAX as a user-friendly and user-centric platform. The same can be said of Coinbase, and a lot of experts have only positive things to say when it comes to Coinbase fielding two separate exchanges. Having two exchanges for different markets allows the company to service both the casual consumers and the more advanced traders. But let’s get back to our (strictly) Coinbase review. Although the primary purpose of Coinbase, like any other cryptocurrency exchange, is to buy and sell cryptocurrencies, there are many other options and additional functions that users can gain access to. For example, users can connect their Coinbase account with their bank account, as well as their credit card and debit card. This allows them to purchase cryptocurrencies as easily and with as little hassle as when they are buying items from a regular online store. Additionally, the same option makes it possible to convert a certain amount of their coins to a fiat currency of their choice and transfer the funds to their bank accounts. The company has developed special offers for businesses, including a service which makes it easier to receive Bitcoin payments from their customers. Expanding on the particular connectivity with banks and credit/debit cards that Coinbase can offer, users can sign up for the Coinbase Shift Card. Developed by VISA, the Shift Card allows Coinbase users to make purchases and pay for services by directly spending the Bitcoin on their exchange account. The payments and purchases are possible anywhere where VISA is accepted, so there is no need to keep an eye out for businesses that accept payments in Bitcoin. The Coinbase account is simply billed the amount in Bitcoin for the purchase based on the current Coinbase Bitcoin price. The Shift Card is available only in certain parts of the United States for the time being. It costs only $10 initially, with no extra Coinbase fees for transactions. Exchanging Bitcoin for USD when making a purchase also comes for free. If you’re only making your first steps into the cryptocurrency market, choosing Coinbase Exchange as the starting point is definitely one of the better options. It was made to be beginner-friendly, which means that the whole sign-up process is relatively straightforward and easy to grasp. You will have to provide your name and your email address and choose a password for your account. Next, you have to choose your account type. You have two options, depending on whether you want to open an individual account or a business account. You will be prompted to verify your phone number. This is the one of several ways to enable Coinbase’s 2-factor identification, which makes accounts more secure than many other options out there. After taking care of security, you can decide which payment method you prefer. There are two available options: credit card and bank transfers. Credit cards have a very distinct advantage over bank transfers: they are instant, while bank transfers can take as long as 4 to 5 days to complete in the US or 1 to 3 days in the EU. To set up a credit card as your payment method, you will have to provide a scan/screenshot of the card. If you choose bank transfers instead, the exchange will start a verification process by completing a couple of small transactions to and from your account. Apart from these two options, users can also connect their PayPal account with their Coinbase account, but transfer options between the two accounts are limited – for now, you can only transfer the profits from selling cryptocurrencies. Once you’ve gotten all of the above steps taken care of, you finally get to the fun part: buying cryptocurrencies! Through your account, you have multiple tabs – a different one for each cryptocurrency, so make sure you are on the right one so you don’t buy the wrong cryptocurrency on accident. After you choose the cryptocurrency and the amount, the system will present you with an overview of the chosen transaction, with details like the Coinbase fees for the service and the amount you intend to purchase. You have to confirm all the details before proceeding. After that, your precious coins are credited to the respective Coinbase wallet. To make transactions using cryptocurrencies (or to send them to a different wallet where you have full control), you first have to access the Send tab. There, you can choose the source wallet, specify the amount you wish to send and enter the public key of the recipient’s address. Once that’s all taken care of, simply click send. If you wish to receive cryptocurrency, all you need is your account’s wallet address. You can pass that on to the sender, who can then transfer the funds to the address specified. To see your wallet address, go to the Accounts tab. Once there, click on the wallet where you wish to receive funds and choose the option “Receive”. Coinbase will then display the wallet address for the wallet you have chosen. Although Coinbase Exchange is simple and easy to navigate, as the above steps illustrate, the level of organization and professionalism that the team work hard to uphold does have a few drawbacks. The high level of security in particular requires certain safeguards which can seem restrictive if you are not a big fan of too much oversight and control on the part of your service provider. To make sure there is no funny business, Coinbase has put in place predefined limits on buying and selling cryptocurrencies. The goal of these limits is to increase account security and prevent fraud. There are ways to go around these restrictions, but they usually involve giving up quite a bit of your private information – which, and you don’t need a Coinbase review to tell you, is a big no-no for many who adhere to the principles of privacy and decentralization that cryptocurrencies are supposed to be all about. Not surprisingly, though, a lot of people don’t really care about white papers and mission statements – the ideology behind Bitcoin and other cryptocurrencies. Many see cryptocurrencies just like any other investment. So, if you’re okay with that, once you’ve performed a certain number of transactions, you can add your phone number, photo id and other information to your account. Much of the process concerning limits, as well as their removal, is done automatically by the system. When it comes to transaction limits, they also depend on your verification status, but your chosen payment method and your country play an even greater role. Just like with limits for buying and selling, there are ways to get higher transaction limits, except when it comes to credit card transactions. To increase their transaction limit, users need to verify their identity. The maximum transaction for US customers is $50,000 per week, while $30,000 being the limit for EU residents. But is trading here safe? That’s what we will show you in the next part of this Coinbase review of ours. Don’t go away! Dedicating a special segment of our lengthy Coinbase review simply to answer the question “Is Coinbase safe?” might seem redundant considering how many times we have already mentioned the company’s focus on security, as well as the various policies, including aforementioned transaction limits, which aim to protect that security. However, since we’ve talked about certain points here and there, but only partially and in segments, a simple recap might be in order, just to put it all in one place. The company’s financial services are supported by major financial firms, with Mitsubishi UFJ Financial Group being a prominent example. 98% of funds deposited by users are kept offline in cold storage. Just in case there is a hack or any other kind of security breach, all funds are insured and the users will be fully reimbursed. Beats losing your hard disk or your security key and losing it all! As a US-based company, Coinbase does business in compliance with strict US State and Federal financial laws. Although the fact that it isn’t decentralized is a common point of criticism, as well as the notion that it operates like a bank, there are a lot of ways in which Coinbase has made a point of being transparent about its operations. For example, the funds deposited by users are stored separately from the funds that the company itself uses. Therefore, the company does not profit by speculating with and investing the funds on its customers’ accounts. If Coinbase goes under, the users will still have access to their funds, which are kept in custodial bank accounts, out of reach of Coinbase and its creditors. The company uses a 2-factor authentication method. As an additional point of authentication, users can set up their phone (SMS authentication) or third party apps, with Google Authenticator and Duo among the more common choices. If users encounter any problems on the exchange, they are first encouraged to check out Coinbase’s Knowledge Base, a comprehensive support page. The page is frequently updated and contains most of the information required, as well as FAQs. When users need help with their accounts, or in case of login problems or security breaches, they can submit detailed and urgent requests to Coinbase’s online customer chat service. E-mail inquiries are also available and encouraged. Response times vary, but most inquiries receive a response within 24-72 hours. Although most users have positive experiences regarding Coinbase’s customer support, there have been some frequent complaints over the past few years. When the company was gaining traction and when its traffic started to grow very rapidly, its customer support agents struggled to provide extensive, in-depth answers to all inquiries in a timely manner. Users complained of receiving “canned responses” and waiting for a long time for their problems to be resolved. These problems, as well as temporary service delays during high traffic have plagued Coinbase for a short time and can be mostly attributed to the rapid growth of the cryptocurrency market and the increased public interest in the industry. The rapid growth and expansion can cause some temporary pains for the customers, but as soon as the infrastructure catches up and the dust settles, we can draw the line and see who the market leaders are. For now, it is obvious that Coinbase is doing more than OK and can certainly be considered a market leader when it comes to cryptocurrency exchanges. 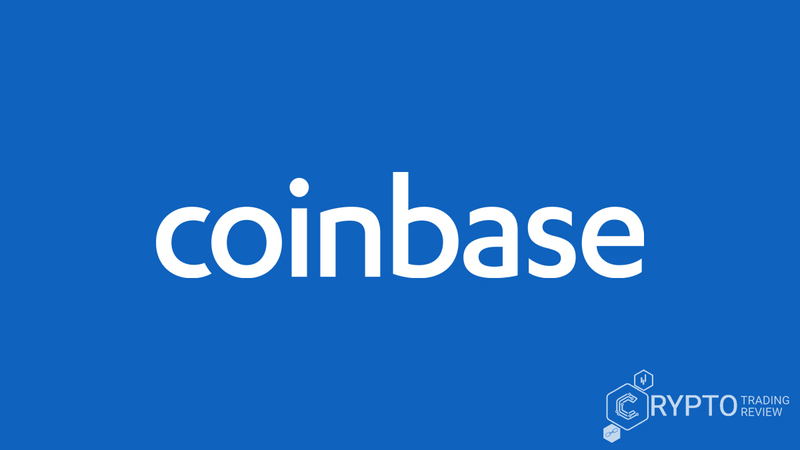 In a recently released statement, Coinbase Exchange informed its shareholders that it recorded profits equaling $1 billion in 2017 – which means that the exchange made $2.74 million a day, and this is just the beginning. Coinbase is the largest Bitcoin broker in the US, and 2017 was a record year all across the board. With 15% of all Bitcoin trade on the market going through Coinbase, it is easy to see how these profits will only continue to grow, especially considering Coinbase’s reputation and the fact that it is the most common starting point for anyone interested in cryptocurrencies. After all, Coinbase was among the first companies which focused on purchasing and selling Bitcoin. It filled a market niche early on and retained its large user base due to its simple design and user-friendly buy/sell process. Even after all these years, this is probably still the best starting point for wide-eyed newcomers who just want to see for themselves what all of this talk regarding cryptocurrencies is all about. We hope our Coinbase review has shown you why. If you want to start trading, opening an account with it is the best move you can make. Do it now and enter the most exciting industry in the world!